The purpose of this online survey was to provide eligible Tibetan electorates with scientific and unbiased opinion poll designed to measure their choice of candidate for the 2016 Sikyong's final election on March 20, 2016. The poll opened on March 2, 2016 and closed on March 11, 2016. In other words, the poll was kept open only for 10 days. 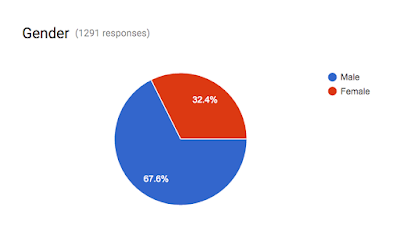 The poll was created using Google Forms to collect the raw data and shared via Facebook wall posts and group posts. No participants were required to identify themselves to participate in the poll. On the survey administrator's Facebook wall post, "Poll Updates" were frequently shared to reach out to a larger number of participants who may not have participated in the poll thus far. The online poll carried only 5 questionnaire items with two on participant's vote and three on participant's demographic. Response to all items were compulsory. 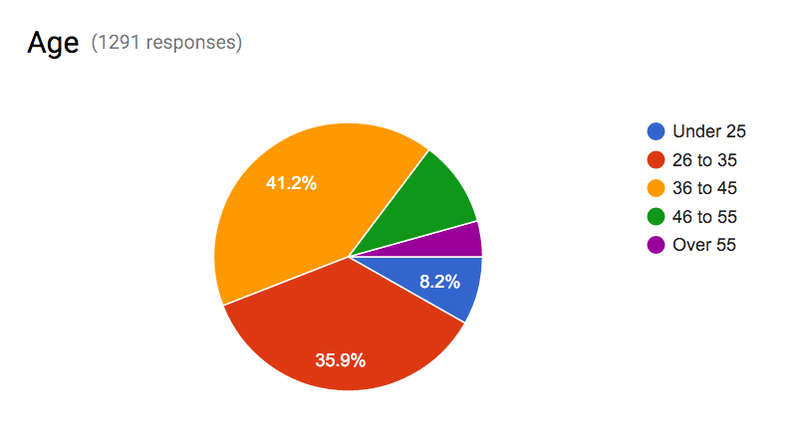 Of the 1291 valid responses, 68% of the participants were male and the remaining 32% were female. Participation from "female" remains low. It is beyond the scope of this poll to analyze the reason behind the low level of participation from our female voters. However, the figure 1 helps to identify an important question for further investigation or research. Of the 1291 valid responses, 43% of the participants were from North America, 29% from India, 20% from Europe, 4% from Nepal and 4% from Others. The biggest challenge with this scientific poll was to reach out to many potential participants from India as majority of the electorates reside in this country. One of the reason for low participation in India could be a lack of fast internet service. For instance, the Tibetan colony where I am staying does not even have 3G internet. Other reason could be the reluctance of this survey administrator in terms of using WeChat for political discourse - WeChat is very popular among Tibetan electorates in India. Of the 1291 valid responses, 41% of the participants were in 36 to 45 age group, 36% in 26 to 35 age group, 10% in 46 to 55 age group, 8% in Under 25 age group and 4% in Over 55 age group. If we look at participants who are younger than 46 years of age, the percentage will be at a high of 85% which is a healthy sign for the nascent Tibetan democracy. Young Tibetans are taking active interest and role in choosing the best candidate for the highest executive post in exile i.e., Sikyong. When asked participants who will you vote for, of the 1291 valid responses, 48.7% (red color) of the participants responded with Penpa Tsering, 47.8% (blue color) with Lobsang Sangay and 3.5% (orange color) with None of the Above. According to the poll, Penpa Tsering is slightly leading ahead of Lobsang Sangay by 0.9 percentage. This tiny difference of percentage could be insignificant as the poll's margin of error could be + or - 5%. Though 3.5% of "None of the Above" seems too small of a percentage, these small group of eligible voters may have the potential to swing the final votes in favor of one or the other candidate. The questionnaire item of "Did your choice of candidate changed since the preliminary election" was primarily asked to analyze the shifting of votes due to EC's disqualification of other three Sikyong's candidates from the final election. For this item, of the 1291 valid responses, 60.9% (blue color) of the participants responded No Change to their choice of candidate from the preliminary election, 22.5% (red color) changed from Lobsang Sangay to Penpa Tsering, 8.9% (orange color) changed from Penpa Tsering to Lobsang Sangay. From this poll results, it is evident that Penpa Tsering largely succeeded in changing the minds of Lobsang Sangay supporters. Among Lukar Jam (Sikyong candidate during the preliminary election) supporters, 2.1% of the participants changed to Penpa Tsering while 2.3% changed to Lobsang Sangay. With the disqualification of Lukar Jam, Lobsang Sangay has gained slightly more supporters of Lukar Jam than Penpa Tsering. Among Tashi Wangdu (Sikyong candidate during the preliminary election) supporters, 1.9% of the participants changed to Penpa Tsering while 0.4% changed to Lobsang Sangay. With the disqualification of Tashi Wangdu, Penpa Tsering has gained sizable supporters of Tashi Wangdu as compared to Lobsang Sangay. Comparing the actual preliminary election results with that of this poll results, Penpa Tsering has greatly succeeded in convincing the Tibetan electorates that he is the right candidate for Sikyong. His month-long campaign and endorsements might have also helped in garnering more public supports for his candidacy. On the similar front, Lobsang Sangay seems to have miscalculated the power of Tibetan electorates. After a very high win percentage in the preliminary election, Lobsang Sangay might not have felt the need to campaign. And when he did come out on a campaign trail, it might have been too late to make an impact. It is evident from the result of this poll that Penpa Tsering did very well when compared to his actual preliminary election results. However, the question is - did Penpa Tsering succeed in gaining enough supports to win this election? Seeing the dismal performance of Lobsang Sangay in this poll, did he lose a large chunk of supporters because of his late jump in the election campaign? Did controversies surrounding Lobsang Sangay made an impact on the hearts and minds of voters? Answers to these questions to be seen on the election day. Looking at the success of this survey administrator in closely predicting the winner of 2015 preliminary election, this race for 2016 Sikyong is now too close to make a call. Any of the two candidates could WIN. During the preliminary election round in October 2015, more than one-third of the Tibetan electorates did not come out to vote. Which candidates have succeeded in wooing these voters will make a huge difference in the final election. Based on this poll, it seems Penpa Tsering did a lot better than Lobsang Sangay in terms of winning more supports for his candidacy. Due to the nature of Tibetan electorate in diaspora, it is near to impossible to conduct an accurate online opinion poll. Nonetheless, this poll have succeeded in providing some dimensions to the upcoming final election on March 20, 2016. On a final note, please do come to VOTE on March 20. No excuses will be enough to miss this important day. It only comes ONCE in five years. Note: Due to the poor internet connection at my current location, it is impossible to do more statistical analysis. If any qualified Tibetan professional is interested in doing further data analysis, please contact me with your short qualification bio and brief description on the intent of analysis. Thanks for your work. We need hard data to understand how politics is played in our community. I wish VOA and RFA will canvas and commission a market research company in India to carry out a survey. Unfortunately, nearly 70% of those participated in your poll are from North America and Europe, thus skewing the result. IF I recall correctly, during the first election you did a similarly poll and the result showed that LS was not the favourite candidate. Nevertheless, it is interesting why the Tibetans in the West are less likely to vote for LS. Does this mean they are more informed or less informed? The overwhelming support for LS comes from the settlements and the monastic community. Needlessly, the say that for any candidates to win s/he has to capture the largest votes in India.